We are centrally located on two acres among the finest wineries and restaurants in the Napa Valley. Our rates include "The best full gourmet champagne breakfast in the Valley" and premium wines and cheeses served in the evening. Each individually appointed room boasts its own private bath and antiques; three have fireplaces and two have their own private entrances. One of which was actually a winery 1883-1887! We are happy to plan entire itinieries for you during your stay; boutique winery tours, dinners; lunches... need to rent bikes? Take a balloon ride... which spa is best? 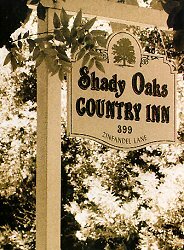 A perfect setting and location, great food, warm hospitality and all of your comforts in mind in every room are just a few of the highlights of staying at Shady Oaks Country Inn. It is our sincere wish that your stay with us be romantic and memorable.